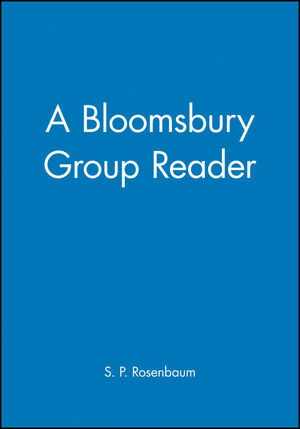 Because whenever they wrote the members of Bloomsbury tried to write well, there is an abundant variety of illuminating and delightful reading to be found in the short prose works of the Group's novelists, biographers, critics, and even political economists. In A Bloomsbury Group Reader Professor Rosenbaum offers a representative selection of such writings by Virginia Woolf, E. M. Forster, Lytton Strachey, Roger Fry, Desmond MacCarthy, Clive Bell, Leonard Woolf, John Maynard Keynes, and Vanessa Bell. His focus in this selection is not upon the lives of the Group but upon what finally must justify our interest in them: their work, in this instance, as writers. S. P. Rosenbaum is the author of Victorian Bloomsbury and Edwardian Bloomsbury - the early literary history of the Bloomsbury Group. He is the editor of The Bloomsbury Group: A Collection of Memoirs, Commentary, and Criticism and Virginia Woolf's Women and Fiction: The Manuscript Versions of A Room of One's Own (Blackwell, 1991). Virginia Woolf: The Common Reader. Lytton Strachey: Preface to Eminent Victorians. Roger Fry: Introduction to A Sampler of Castille. E. M. Forster: Introduction to Collected Short Stories. E. M. Forster: The Point of It. Leonard Woolf: Pearls and Swine. Virginia Woolf: Mrs. Dalloway in Bond Street. E. M. Forster: The Emperor Babur. Lytton Strachey: Madame de Sevigne's Cousin. Virginia Woolf: Julia Margaret Cameron. John Maynard Keynes: Mr. Lloyd George. Lytton Strachey: A Victorian Critic. Desmond MacCarthy: The Post- Impressionists. Roger Fry: Art and Socialism. Clive Bell: The Artistic Problem. Leonard Woolf: Fear and Politics. John Maynard Keynes: Economic Possibilities for our Grandchildren. Virginia Woolf: Memories of a Working Women's Guild. E. M. Forster: What I Believe. Lytton Strachey: Art and Indecency. Virginia Woolf: Mr. Bennett and Mrs. Brown. J. M. Keynes: On Reading Books. E. M. Forster: English Prose between 1918 and 1939. Lytton Strachey: Mr Hardy's New Poems. Desmond McCarthy: The New St. Bernard. Leonard Woolf: Freud's Psychopathology of Everyday Life. E. M. Forser: The Complete Poems of C. P. Cavafy. Part VII: Travel Writings:Desmond MacCarthy: Two Historic Houses. Leonard Woolf: Politics in Spain. Vanessa Bell: Notes on Virginia's Childhood. Leonard Woolf: Coming to London. Desmond MacCarthy: To Desmond MacCarthy aet. 22. E. M. Forster: Three Countries, Clive Bell: Paris in the 'Twenties'. Desmond MacCarthy: A Critic's Day-book. Lytton Strachey: A Fortnight in France. E. M. Forster: Indian Journal. John Maynard Keynes: Concluding Notes on the General Theory. E. M. Forster: A View without a Room. Virginia Woolf: The Love of Reading. * Gathers together a whole corpus of often little known writings by prominent literary figures such as Virginia Woolf, E. M. Forster and Roger Fry. * Many key pieces not previously reprinted. * Draws widely from writings on art, literature, psychology and politics. * Includes brief summaries as head notes to each piece.